Many thanks to Walmart and Kingsford charcoal for their sponsorship of this post. Does your family like grilling and burgers as much as mine does? I live in San Diego, so I feel pretty lucky that I can grill almost all year round. 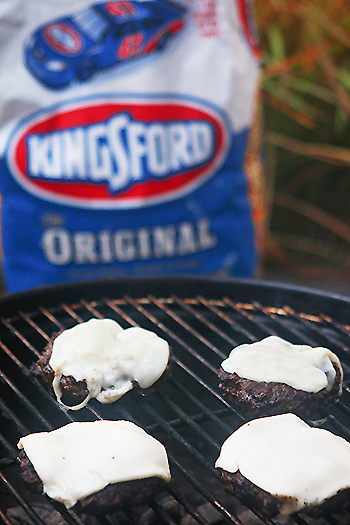 When Kingsford Charcoal and Walmart approached me to make a grilling recipe with Walmart meats I wanted to come up with something just a little different. And I think that this burger does the trick. It’s a Philly CheeseSteak Burger. And I will brag just a little..
It’s moist, juicy and has a ton of flavor. When I was researching Philly Cheesesteaks I noticed that they are actually pretty simple. Not a lot of spices, just the basics. So I wanted to keep this burger that way, too. Some recipes had grilled mushrooms, so I actually decided to mix though into the meat to make it even more moist and flavorful that it already was. 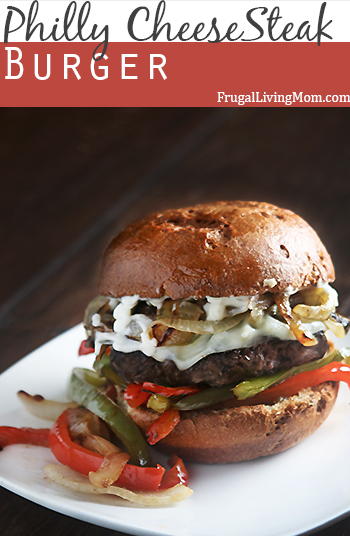 The burger does take a bit to prepare as it has multiple ingredients. One way that you might want to speed up the process is to grill the onions and peppers all together; this will probably reduce the prep/cooking time by around 8 minutes. And I think it will still work nicely. Also, we are gluten free, so I used gluten free hamburger buns, but your favorite buns will work for this recipe. Hope you enjoy, let me know if you do. Place ground beef into a medium to large bowl, set aside. Add mushrooms olive oil and onion powder, salt and pepper to a food processor. Add mushroom mixture/paste to the beef and combine. After combined separate mixture into 2 sections and divide each section into 2 burgers, making 4 burgers total. If you have a large grill cook all the burgers at once. Cook 5-7 minute per side or until done. 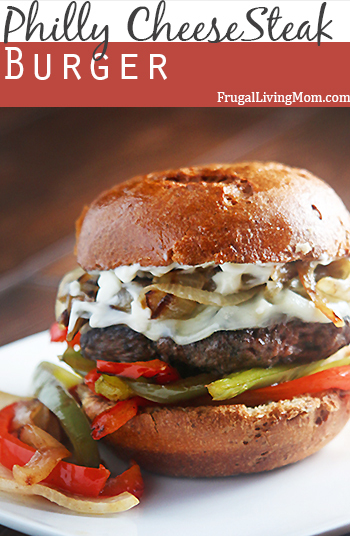 Add 1 slice of cheese to each burger the last minute or two of cooking. While burgers are cooking prepare a skillet with 1 tablespoon butter and heat to medium. Add onions and a pinch of salt and caramelize over medium to medium high heat for 7-9 minutes. Add a pinch of salt and caramelize over medium to medium high heat for 10-12 minutes. Place bun top on each burger.